today’s low volume fertilizer applications. 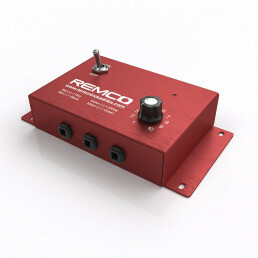 REMCO Speed Controllers are available in 15 & 35 amp ratings and are all available with our digital pressure display. The digital pressure display allows the user to keep harmful pressurized chemicals out of the tractor cab by using a remote ¼” MNPT stainless steel sensor and wiring harness. REMCO also offers an optional auxiliary stainless steel ammonia pressure gauge with or without a plumbing kit. Our controllers are equipped with circuit breakers and can easily be reset by simply turning the controller off and back on. Sized in conjunction with Remco Industries Pro-Flo pumps.